Safety training is an important part of the employee onboarding process. If there’s a mishap at your workplace and an employee gets hurt, s/he could file a lawsuit against you. In such a scenario, if your organization is found to be non-compliant with the safety norms, it will not only affect your company reputation, but will also cost you money. Therefore, it is essential for every organization to comply with all the necessary standards of workplace safety as prescribed by OSHA. The implications of not adhering to the legal standards could be far worse than one angry employee. Every employee expects a safe working space. Whether they work in a factory, in an air-conditioned office or on the field, it is your duty to ensure that all the safety parameters are met, all possible hazards are recognized and that there’s provision to handle any accident at the workplace. Every year, more than 4.1 million workers suffer a serious job-related injury or illness. Which means hours and hours of lost productivity, directly affecting an organization’s revenue. How will you ensure that all your employees undertake workplace safety training? Arranging for group training sessions and workshops might not guarantee complete attendance. In such a situation, where the training is compulsory, but you can’t ensure 100% uptake, you can deliver it on mobile devices. Most industries have now started using mobile devices for delivery of induction training, product training, and other skill development modules. Whether it’s sales professionals, retail sector employees, doctors or employees from any profession or job, mobile learning is the best method to train the dispersed and ever-busy workforce. Every job has different requirements and work environment. You cannot give the same training to employees working at a construction site as the one given to fire marshals. For employees sitting in an office, the risk factors are very different from the ones who are constantly required to travel. There’s no one-size-fits-all when it comes to workplace safety training. So, depending upon the workplace location and the working conditions, an effective training program must be devised, complete with identification of hazards and methods to deal with them. Even if you use a mobile device to deliver training, if the course is not engaging enough, it will fail to have an impact on the employees. Create engaging videos showing what to do in a critical situation. Or you can have an animated video showing the same. Animated videos are far more effective in capturing the interest of the audience as it lets you add some elements of humor to make the content more engaging. The training materials must have links to detailed explanations of certain laws and policies so that employees can go through them in their own time. Also ensure that they have gone through the procedures and policies and have understood them by way of post-training assessments. You can track their performance to monitor the effectiveness of the safety program. Creating online assessments and using real-time analytics will let you know the progress status of each employee. You can thus ensure that every employee has undertaken the course. The training content should include virtual scenarios to help the employees understand and identify hazards, show them how to report these hazards and the correct way to deal with them. An effective workplace safety plan must include all these details to prepare the employees for any kind of emergency situation. For example, if a coworker suffers a sudden seizure, employees must be aware of what measures are to be taken in this case. Provide them with multiple options on their device screen, so that they can identify and select the correct option. This will help them remember the answers and prepare them for any untoward incident at the workplace. Similarly, you can create virtual fire escape scenarios, allowing the employees to escape the virtual premise within a specific time limit. As technology evolves, there comes newer and better equipment and tools. 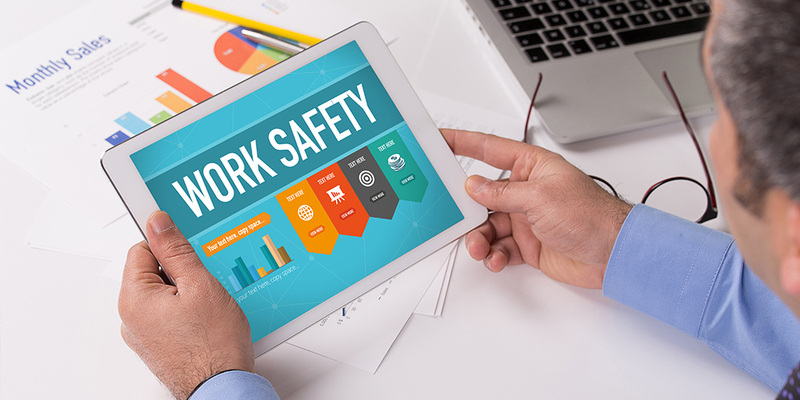 The last time you delivered the workplace safety training, the functions of the equipment used for manufacturing or production could be slightly different from the latest model. So, now the employees need to be trained on how to maintain precaution and safety around this new equipment. Hence, organizations need to create and deliver refresher training to keep the employees updated. Even for employees in offices, provide regular refreshers on health safety regarding seating position, fire safety, workplace violence etc. Conducting workplace safety training is necessary for every organization. Your employees are your most important assets. While they are working for you, ensure that they in a safe place. And to guarantee employee safety, employers must comply with all applicable OSHA standards. Safety also includes being free from illness. The L&D and HR teams can create engaging training modules on various topics which will benefit the workforce such as road safety, healthy eating, disease or illness-related awareness training etc. You’ll find that employees who are physically and mentally fit are more productive and enthusiastic towards their work. While delivering workplace safety training, inform them of their point of contact, whom to approach and where to go in case of an accident. Making the employees aware of their occupational hazards will ensure alertness while working, which will help prevent accidents and injuries.